Happy Friday everyone! I've been so excited for this post for quite some time! 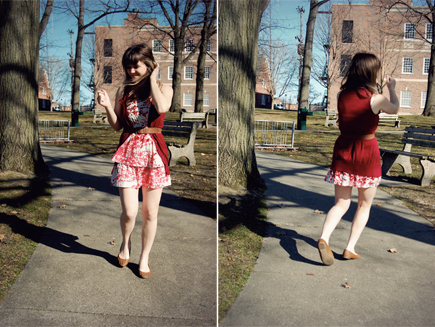 The Delightful Dozen was asked to style a dress from ModCloth and we all agreed on this dynamite dress! 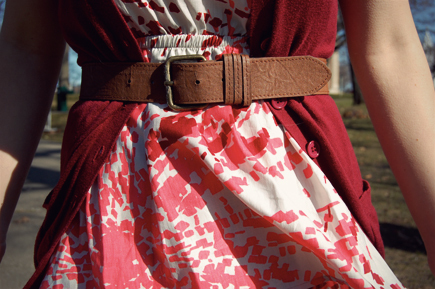 It's perfect for spring and can be remixed in several ways to fit all of our different styles! The fabric is light - and I love the pattern! I can't wait to wear this come warmer weather, trotting down the beach! I'm excited to see how the other girls have styled this! 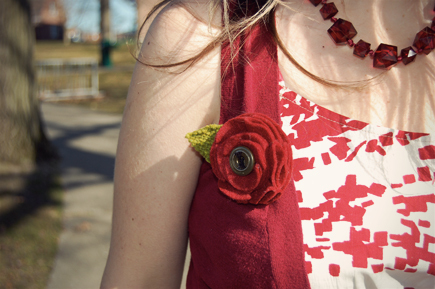 On the day I took these photos, it was a little chilly, so I paired my maroon vest with it for a bit of warmth... and my brooch I got from Jen Loves Kev's giveaway back in December! See? If you don't know how to style something... just wait! It'll come to you! 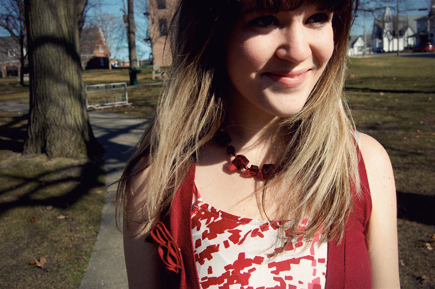 I know I rave about ModCloth a lot, but I truly truly mean it. I've never had a bad experience shopping with them (and I shop there... maybe too much for Brett's liking!) but I love their selection of clothing. They work so hard to support the blogging community and I think that is just amazing. They truly care about their customers - one time I bought a dress that was just skin tight and they worked with me right away to get it sent back in and a size up sent back out. Their blog is so fun to read, they host really great contests and have a Flickr style exchange group where you can upload your outfits featuring clothes from them and get some great feedback from amazing girls in our community! So be sure to check out their site if you haven't already. They're my fave, obviously! It looks like tonight Brett and I are ordering from our favorite pizza place in town for their most delicious square pizza ever and cheese sticks and then going to see Hot Tub Time Machine. It is honestly the perfect night for me. I'm a seriously simple person. Give me some delicious pizza, an insanely good looking husband, a funny comedy with buttery popcorn and a diet soda along with some late night blogging and the thought of sleeping in the next morning... and I'm a truly content girl! You could also throw in some packages at my door step when I get home from work filled with lovely clothing. That'd be the perfect day!